Josiah Spaulding Jr. of Citi Performing Arts Center and other “The Addams Family” producers voted to begin a post-Broadway tour in 2011 in New Orleans, citing a tax credit. 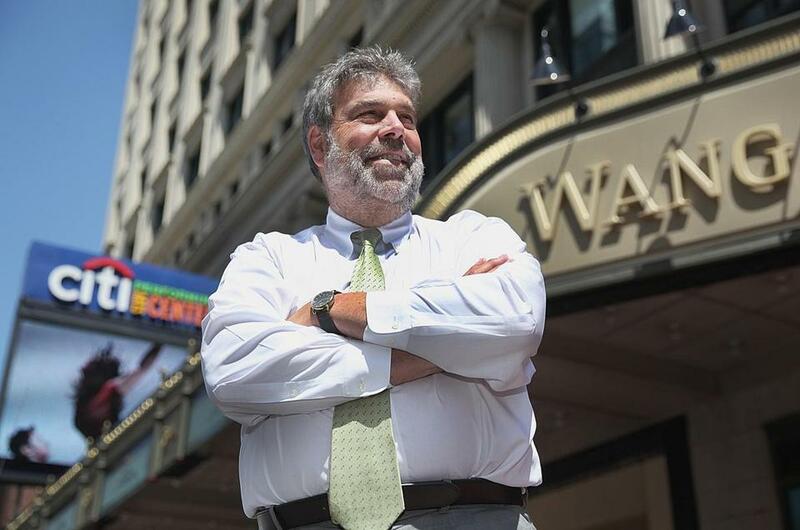 A plan to restore theater’s Boston-to-Broadway pipeline with up to $3 million a year in production tax credits awaits the governor’s signature, and backers hope it will light up marquees more often here. The plan, part of an economic development bill awaiting Deval Patrick’s signature, provides tax credits equal to 25 percent of local production spending for shows that play in larger theaters in Massachusetts before moving to Broadway or off-Broadway venues. That includes anything from salaries to building sets, to housing and feeding out-of-town cast and crew. The credits would also cover post-Broadway shows that begin their national tours here. Counting rehearsal and set-up time, a pre-Broadway production could stay for as long as 10 weeks and spend $2 million, including labor and promotion, for several weeks of performances, Jaffe said. Boston was long a standard stop for shows heading to New York, whose producers would plan extended stays here for rewriting and fine-tuning. But recent tax credit programs for theaters in Rhode Island, Louisiana, Chicago, and upstate New York have cut into that business, say the plan’s supporters. That became especially clear to Citi Performing Arts Center president and chief executive Josiah Spaulding Jr. when he voted with other producers of ‘‘The Addams Family” to begin the post-Broadway tour of that musical in 2011 in New Orleans, after Louisiana initiated a tax credit. The tax credit plan is part of an economic development bill that passed the House and Senate by wide margins. Patrick has not indicated what action he will take, but backers are hopeful he will sign it, so that the first eligible show might appear in Boston in fall 2015. The deadline for Patrick’s signature is the close of business Thursday. The plan parallels controversial state tax credits for film production, but backers say they’ have tried to make it more palatable with the $3 million annual cap on the credits — as opposed to the open-ended film credit program, which issued nearly $36.5 million in credits in 2012. There’s also a five-year sunset to the plan and a requirement that eligible pre-Broadway shows open in New York within one year of closing in Boston. “We are happy to be held accountable,” said Jaffe. Still, not everyone likes the idea. Small local theaters are looking on from the sidelines. “You could take 5 percent of that [$3 million] and invest in artists actually living here,” said Charlotte Meehan, artistic director of the fringe Sleeping Weazel theater company, whose shows typically draw audiences of fewer than 100 people. She said she doesn’t begrudge the breaks for Broadway-bound shows, but she also sees homegrown art and culture groups struggling for support every year. Christopher Welling, president of Local 11 of the International Alliance of Theatrical Stage Employees, the stagehands’ union, participated in early discussions about the tax credit with the plan’s sponsors, Democratic state Representatives Nick Collins of South Boston and Paul McMurtry of Dedham. Welling said the 250 members of Local 11 and members of smaller locals for costumers and front-of-house personnel, including ushers and box office workers, would benefit substantially from each show added to the schedule. Local 11 might have about 50 members hired for a week or more to assemble a show, he said, with 15 to 20 staying on for the duration of its run, and another large contingent on the typical one-night load-out. Local 11 members alone could take in $250,000 in wages over five or six weeks, he said. But they’re not the only ones who benefit, he said. “If you’ve been down in the neighborhood around the Opera House when ‘Phantom of the Opera’ is going on or ‘Wicked,’ I’m sure the restaurants and parking lots and all of that really enjoy the fact that theater is booming sometimes,” Welling said. The tax credits would be eligible to nonprofit as well as for-profit enterprises. In most cases, as with the film tax credits, productions won’t pay enough taxes to use the credits, backers say, so the credits will be sold to institutions such as financial and insurance companies that need them. A dollar in tax credits reduces a company’s tax payments by that amount. Supporters emphasize that the credits reach beyond Boston, mentioning the 700-seat Mahaiwe Performing Arts Center in Great Barrington and the 2,300-seat Hanover Theatre for the Performing Arts in Worcester as possible beneficiaries. For signs of a tax credit that has succeeded, you only have to look down I-95 to Providence, where theaters were added to the state’s film tax credit two years ago. Since then, the 3,000-seat Providence Performing Arts Center has been the starting point of five post-Broadway tours: “Elf” in 2012; “Evita,” “Once,” and “Phantom of the Opera” in 2013; and “Cinderella” coming this fall. The venue had inaugurated tours before, “but suddenly we were the hot date,” said J. Lynn Singleton, president of the center. The argument that there are residual benefits for the local economy does not sway detractors. “Everybody’s going to get some business, everybody’s going to get some work, but it’s not nearly enough to offset the tax giveaway,” Blumenreich said. Data show that such tax breaks “are a very cost-ineffective means of creating jobs and income for Mass. residents,” says Robert Tannenwald, a former Federal Reserve Bank of Boston economist who is now an adjunct lecturer at the Heller School for Social Policy and Management at Brandeis University. The programs divert revenue that could provide government services, and “99 times out of 100” the public loses, said Tannenwald. “I’m hoping that it actually helps attract relationships and the development of new work in the Commonwealth,” said Michael Maso, managing director of the Huntington. The tax credit plan is limited to plays presented in venues of 600 seats or more. That means recent Broadway shows that took off from the American Repertory Theater, including “The Gershwins’ Porgy and Bess,” “The Glass Menagerie,” “Pippin,” and “All The Way,” would not have qualified, because they played in the 550-seat Loeb Drama Center in Cambridge. "Stick Fly” might also not have qualified because it played in a smaller house. Maso called the 600-seat figure “unfortunate.” ART managing director William Russo said he has not heard much about the tax credits nor pursued the issue, because while they might provide an added benefit, they were unlikely to change decisions about the shows that the ART presents. “While they’re shows that have ambitions, when we look at them, we’re really just looking at them for here,” Russo said. None of the bill’s backers could explain why the line was drawn there except to say that it was intended to accommodate the 700-seat Mahaiwe. But Jaffe said incentive plans elsewhere have been limited to significantly larger venues where the economics of a Broadway production made sense.